When I decided that I wanted to take the big step of adopting a dog, the search for the perfect breed began. Being a "dog person", I have never met a dog I didn't love. Little ones, big ones.....but like kids, I liked them best when they went home with their parents, and not with me! They were never "my" dog, so I didn't have the love needed to overlook some of their quirks. I was in search for that perfect "one." I talked to friends and family for suggestions and insight. I was searching the adoption and rescue groups - that being the only way I would adopt. 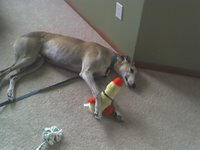 A friend of mine suggested I look into rescuing a greyhound. "Seriously?!?" I asked. That first question was followed by all of the standard misconceptions that people have about the breed. Being my typical self, I did the research to validate my feelings. I found many sites that explained the behavior and needs of greys. The more I read and the more pictures I saw, the more intrigued I became. Their eyes were so precious! I saw that our local rescue group had a Meet & Greet coming up, so I planned to attend. Wow! I didn't expect to fall in love so quick. It was at this first m&g that I met Hoss. He drifted towards me - more like lumbered - and velcroed himself to my legs. He was the perfect height for petting, and he had a great temperament. I had it in my head at that time that I wanted a female, so adopting Hoss didn't even cross my mind. That same weekend, I went 2 hours East to attend another m&g where an available female was being fostered, and would be available to meet. She was sweet, but I did keep thinking back to Hoss and his demeanor. She wasn't quite the same, but I still thought I wanted a female. I wasn't ready to adopt anyway, and knew she had another family interested. I figured (hoped) I would connect better with the next one. I moved forward getting my housing association to change their rules to allow for a greyhound (which is way over the 20 lb limit that was currently in place). I finally got the email that said I was good to go, so I called the adoption group right away. There were no girls available, but Hoss still was. 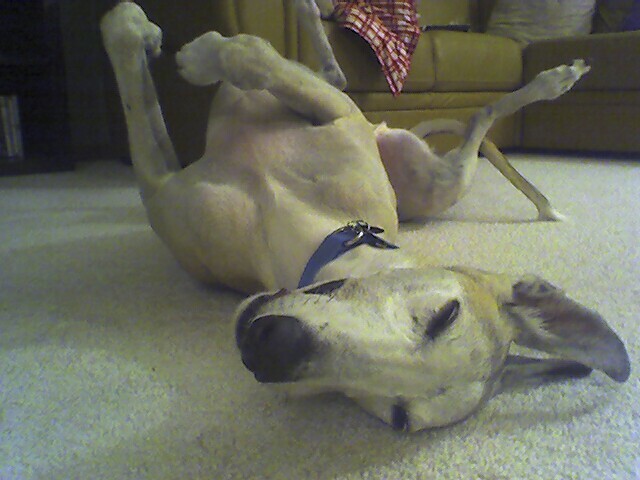 At 7 years old, he wasn't at the top of the "Most Eligable Greyhounds" list, given greys typically live 14-15 years. This didn't matter to me - his personality was so cool, I just knew he was right for me. We set up a home visit and all went well. I had bought a stuffed ducky as a gift for him, and he played with it that day. He even laid down to relax with the duck between his arms. On September 6, 2006, my adoption of Hoss became final. We met up to sign the paperwork, then Hoss came home with me. I was so nervous, thinking to myself and wondering if I was really ready for this animal to be reliant on me to take care of him. Because of my research, I was prepared for the transition period that was about to occur. He didn't hardly eat the first few days, and he just seemed to be going through the motions. I wasn't seeing that personality that I had seen before. I knew I had to give it time......just give it time. 2 months later, wow, what a difference. Hoss' personality is bigger than I ever imagined. He is so charismatic and has a defined sense of self. We've been through some separation anxiety issues which has led us to getting Hoss a brother (more about that later). And now that I have two, I've gone so far as purchasing a second vehicle just to haul the dogs around.